Local listing is different to statutory listing; it does not provide further legislative controls, and does not affect when planning permission is required. However, when planning permission is required, the ‘special interest’ of a locally listed heritage asset will be taken into account. In 2013 the council asked for nominations for inclusion in the list; over five hundred submissions were considered. The agreed list has not yet been finalised. For information on other items in the draft list see here. The building was built in 1909 and ceased to be operational in 1946. It is constructed of white glazed brick with terracotta dressings and has a hipped roof (a type of roof where all sides slope downwards to the walls, usually with a fairly gentle slope). The ground floor has three arched openings of which the central is wider. Above the central arch is a plaque which says ‘Fire Station’. Above this the central window rises through the eaves to form a small gable with finials to either shoulder; bullseye windows are set to either side. 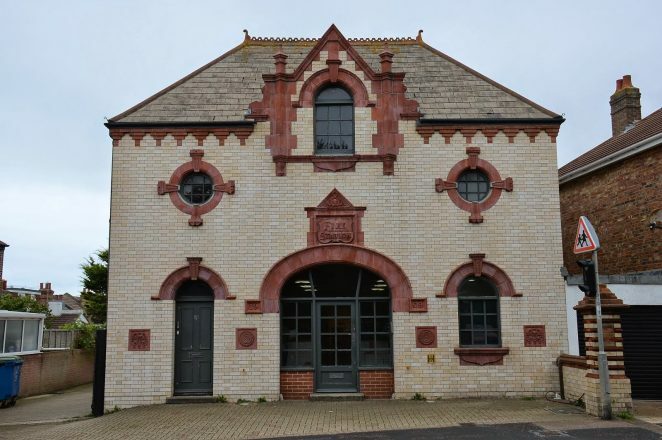 Two small terracotta plaques on the wall incorporate the seal of the former ‘Portslade by Sea Urban District Council’ which was the governing body from 1897 to 1974. This building was chosen as it was seen to be of architectural, design and artistic interest, being a good example of the rare use of glazed white bricks and terracotta. It is an uncommon survival of a building of this type and age, particularly in relation to the fact that despite its internal conversion, the exterior is complete. Does the building now house flats, or has it been divided into terraced houses? Hi Stefan. If you look through each of the ground floor windows (in the large version of the photo! ), there appear to be goods stacked on the floor. The lighting seen through those windows indicates commercial or office use, rather than residential. A Google search of the address brings up several different businesses, so it could be a shared space. Regards, Alan. If so, it’s a shame! Thanks. Built by my 2nd cousin 2 times removed, Ernest Clevett and his company who also built the Salvation Army Citadel and local houses.